141 Beacon is located on the south side of Beacon, between Arlington and Berkeley, with 139 Beacon to the east and 143 Beacon to the west. 141 Beacon was built ca. 1860, one of two contiguous houses (139-141 Beacon) designed as a symmetrical pair with 141 Beacon two feet wider than 139 Beacon. 141 Beacon was built as the home of Eunice Hooper and her sister, Mary Ingalls Hooper. They previously had lived in Marblehead, where they continued to also maintain a home. The Misses Hooper purchased the land for 141 Beacon on January 25, 1860, from John Lowell Gardner, a shipping merchant and real estate investor. He and his wife, Catharine Elizabeth (Peabody) Gardner, lived at 7 Beacon, and would build a new home at 182 Beacon in the mid-1860s. The lot was part of a larger parcel John L. Gardner had purchased on September 15, 1859, from William W. Goddard and T. Bigelow Lawrence. That parcel was part of a tract of land that William Goddard and T. Bigelow Lawrence had purchased from the Commonwealth of Massachusetts on August 1, 1857, that included all of the land on the south side of Beacon Street from Arlington to Berkeley. Click here for an index to the deeds for 141 Beacon. Eunice and Mary Hooper lived at 141 Beacon with their mother, Eunice (Hooper) Hooper, the widow of merchant John Hooper. She died in December of 1866. Mary Ingalls Hooper died in January of 1874. Eunice Hooper continued to live at 141 Beacon and in Marblehead. By the late 1880s, Eunice Hooper had been joined at 141 Beacon by her nieces, Jane Greene Hooper and Elizabeth Reed Hooper, daughters of her brother Nathaniel Hooper and his first wife, Harriet Rose (Wilson) Hooper, and her nephew, Samuel Hooper Hooper, son of Nathaniel Hooper and his second wife, Emma Lincoln (Bird) Hooper. They previously had lived at 264 Beacon with their father, who had died in May of 1886. Samuel Hooper Hooper was a real estate investor and investment banker. In later years, he became a wine importer. He organized and led the Boston Assembly society balls for many years, and was a founder and the first president of the Tennis and Racquet Club. Eunice Hooper died in March of 1893. Samuel, Jane, and Elizabeth Hooper continued to live at 141 Beacon. Jane Hooper married in April of 1895 to Edward Gardiner Gardiner, a biologist, and moved to 131 Mt. Vernon. Elizabeth Hooper married in July of 1899 to Cornelius Grinnell Betton, an architect, and moved to Newport (he died in May of 1901). Samuel Hooper Hooper continued to live at 141 Beacon in 1899, but by 1900, had moved to an apartment at 112 Pinckney. In June of 1900, at the time of the 1900 US Census, 141 Beacon was the home of Henry Demarest Lloyd and his wife, Jessie (Bross) Lloyd. Henry Lloyd was a leader of the progressive reform movement and had authored several books advocating reforms of business and politics. He had served as an editor of the Chicago Tribune until 1885 and is credited as being America’s first investigative reporter. 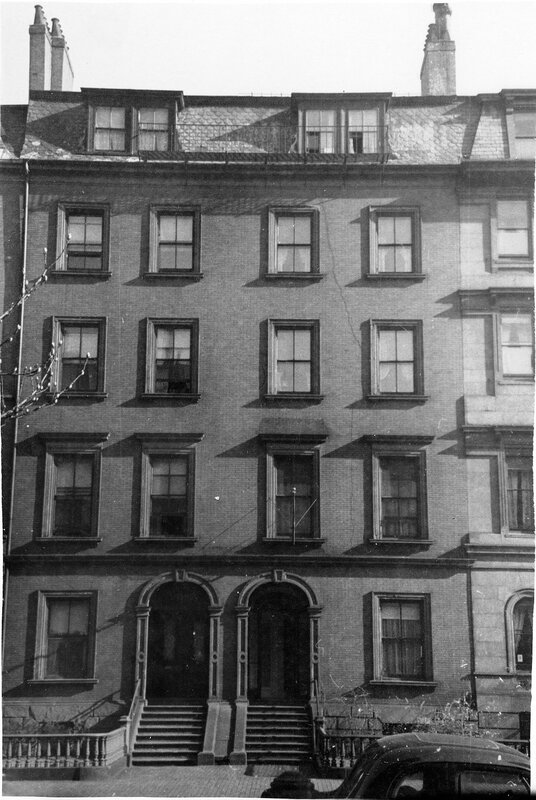 141 Beacon had been inherited by Elizabeth (Hooper) Betton and on March 21, 1900, she transferred the property to her husband. On May 13, 1901, it was acquired from Cornelius Betton by Samuel Hooper Hooper, and on June 1, 1901, it was acquired from him by Edmund Dwight Codman. 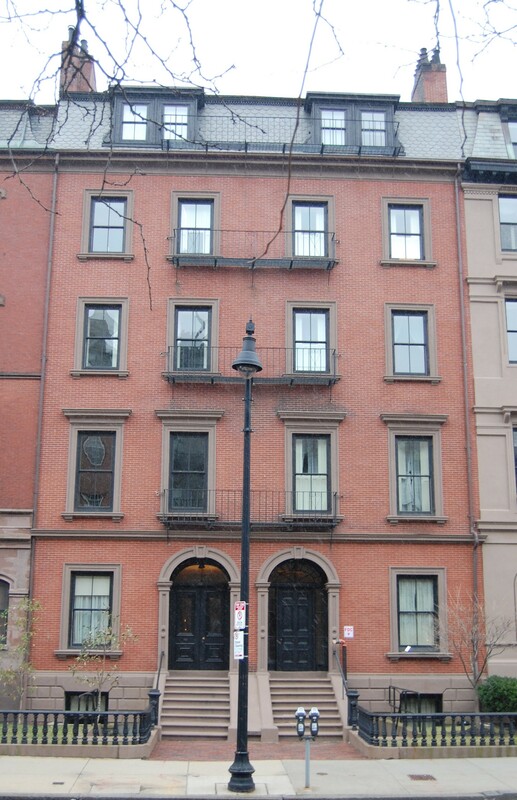 Edmund Codman and his wife, Annie (Briggs) Codman, made 141 Beacon their Boston home. They previously had lived at 9 Chestnut. They also maintained a home in Westwood, Massachusetts. Edmund Codman was an attorney. During his career, he also served as president of the Fitchburg Railroad, treasurer of the National Dock and Storage Warehouse Co., and vice president of the Massachusetts Hospital Life Insurance Company. In July of 1938, he applied for (and subsequently received) permission to convert the house from a single-family dwelling into a lodging house. On the same day, Laura Davies filed to convert 139 Beacon into a lodging house. They each also filed to erect fire balconies between the two houses. The Codmans moved soon thereafter to Westwood. By 1939, William Cornell, an insurance salesman, and his wife, Gertrude Dake (Lane) Cornell, operated the lodging houses at 139 and 141 Beacon. They lived at 139 Beacon in 1939, but had moved to 141 Beacon by 1940. They continued to live and operate the lodging house at 141 Beacon until 1942. 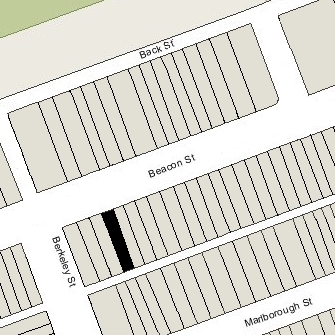 By 1942, 141 Beacon was the home of Elizabeth Krauss, who continued to operate it as a lodging house. Her brother-in-law and sister, Francis Ford Flanagan and Catherine (Krauss) Flanagan, owned 139 Beacon and operated it as a lodging house. In July of 1942, Elizabeth Krauss purchased 115 Beacon and subsequently converted into a lodging house. In about 1945, she moved to 115 Beacon, continuing operate lodging houses both there and at 141 Beacon. In August of 1944, Elizabeth Krauss and Catherine (Krauss) Flanagan acquired 131 Beacon, which they operated as a lodging house until July of 1959, when they sold it. From the mid=1940s through the mid-1950s, Elizabeth Krauss also operated a lodging house at 418 Beacon. On March 2, 1948, Elizabeth Krauss acquired 141 Beacon from the estate of Edmund Codman. She continued to operate it as a lodging house and to live at 115 Beacon until about 1956, when she moved back to 141 Beacon. Catherine (Krauss) Flanagan died in February of 1970 and in September of 1972, Elizabeth Krauss acquired 139 Beacon from their sister, Marie (Krauss) Majane, who had inherited it from Catherine Flanagan. On October 30, 1997, 139-141 Beacon were purchased from the Elizabeth Krauss 1997 Revocable Trust by Fisher College. At the same time, the college also purchased 115 Beacon from another trust established for the benefit of Elizabeth Krauss. In December of 1999, Fisher College filed to change the legal occupancy of both 139 Beacon and 141 Beacon from lodging houses to twelve apartments each. The applications were approved but were abandoned, and both properties continued to be operated as lodging houses. Fisher College continued to operate 141 Beacon as a lodging house in 2015. As of 2015, Fisher College owned 102-104–106–108–110–112–114–116–118 Beacon, 111 Beacon, 115 Beacon, 131–133 Beacon, 139-141 Beacon, 1 Arlington, and 10-11 Arlington.